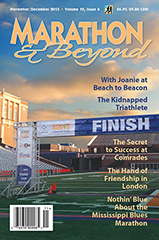 All the writers in M&B are runners (some also happen to be professional journalists), coaches, or scientists. Members of M&B’s science advisory board—some of the top researchers in the world in the science of running—are frequent contributors. Our writers have included a former Olympic marathoner, an elder statesman of the Boston Marathon, and may others who know the rewards and challenges of long-distance running.